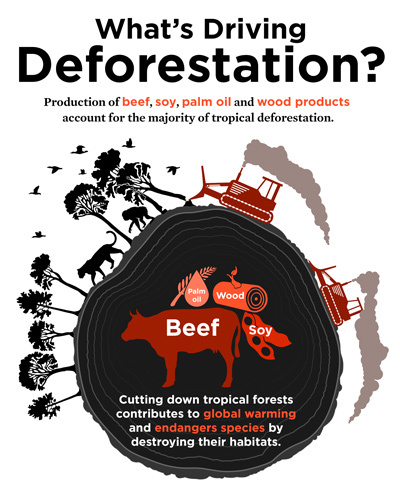 Tropical deforestation is overwhelmingly driven by just a few global commodities: palm oil, wood products, soy, and beef. These four commodities account for the majority of all global warming emissions from tropical deforestation. However, many other commodities, such as coffee, cocoa, and sugar—as well as processes such as mining and shifting cultivation—are often described as significant drivers of deforestation. While many of these are important historically or within certain regions, their total contributions to global deforestation rates are relatively low. 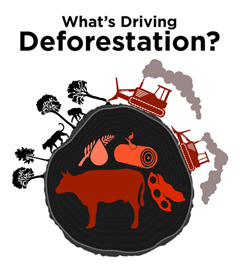 Yet many of these smaller drivers function in ways that help us understand the trajectory of regional deforestation. Some, such as coca and mining, are often the first to move into previously inaccessible areas. Others, such as coffee and rubber, have sometimes been produced through agroforestry systems, which support a variety of species and provide some carbon storage and habitat (though less than intact forests). Agroforestry systems have sometimes helped to protect remaining forests by adding economic value; at other times, they have been a step between forests and plantation agriculture. We highlight here some of the commodities and practices most often linked with tropical deforestation, in order to give a broader view of what contributes to deforestation. This list does not cover the full range of processes and commodities linked with deforestation, but are a few of the most commonly referenced. In Colombia, Bolivia, and Peru, growing coca for the production of cocaine has contributed to forest destruction in both the Amazon and the Chocó, forests on the northwestern coast of South America. While there is some legal cultivation of coca in each of these countries, much of it is illegal. Therefore, coca is unlikely to accompany development and roads. To evade detection and eradication, small patches of coca are grown in relatively remote areas. Because of coca's illicit nature, farmers seeking to avoid detection often have to switch locations and clear new land–thereby abandoning arable land and increasing the disturbance footprint of coca agriculture. In Colombia, coca is estimated to have caused 290,000 hectares of deforestation between 2001 and 2014, an area about half the size of Delaware. First cultivated in Central America, the cocoa bean is now grown, traded, and consumed around the world as chocolate. Chocolate consumption is primarily driven by first-world western nations, with the United States in the lead; the average U.S. citizen eats more than nine pounds of chocolate per year. Yet the majority of the world’s cocoa is grown in just two nations. Cocoa comprises more than 7% of GDP for Cote D’Ivoire, and more than 3% for Ghana. In the past, cocoa production has frequently come at the expense of western Africa’s tropical forests, hotspots for biodiversity and endemic species. Currently some of the areas most threatened by cocoa expansion are protected areas in the region. Cocoa has long been grown in the shaded understory of tropical forests. However, higher yields in full sun exposure have led to many farmers changing to systems without shade, in some cases by cutting down trees. In addition, because cocoa is easier to grow and more profitable in early rotations, cocoa farms frequently are repurposed for other crops, sometimes oil palm plantations. The United States is a huge importer of coffee, consuming more than any other country. Brazil is the world’s leading producer of coffee beans, followed by Vietnam, Indonesia, and Colombia. Coffee can be grown as part of system that includes other tree species ("shade-grown coffee"), and can provide habitat for significant levels of biodiversity. For this and other reasons, such as carbon sequestration, many conservationists have promoted shade-grown coffee. In some places, such as El Salvador and Ethiopia, shade-grown coffee has helped to protect tropical forests by making them more valuable. However, more intensive cultivation systems known as “sun-grown” have consistently higher yields than shade-grown coffee but lose the carbon and biodiversity benefits of shade-grown systems. In Vietnam, a country where forests are expanding overall, coffee bean expansion is contributing to forest loss in some areas. Corn has a variety of uses; it serves as the main ingredient in staple foods in Mexico and as a feedstock for ethanol fuel in the United States. On the global market, however, corn is most often traded for use in animal feed. Brazil is the #3 corn-producing country and the second largest exporter in the world. In the past decade or so, about 60 percent of Brazil’s corn production increase occurred in Mato Grosso, the Amazon frontier state. Because most producers in this region double-crop soybeans and corn, links between soy and past deforestation involve corn as well. In Brazil, corn and other crops are also responsible for displacing pastures for livestock, pushing pastureland into the Amazon. Furthermore, about 30 percent of Brazil’s corn crop originates in the Cerrado, a savanna rich in both biodiversity and carbon. At least 40 percent of the Cerrado’s natural vegetation has been converted to agriculture thus far, and the region enjoys fewer protections than the nearby Amazon. Natural rubber is formed by processing latex harvested from rubber trees. Most rubber is turned into tires, but it's also used for a variety of other products, such as tubing, shoes, and insulators. While rubber is grown in tropical regions around the world, as of 2013, around 92% of the world’s rubber was grown in Asia. For years, rubber has been cultivated in Southeast Asia as part of agroforestry systems, in which small farmers combined many different crops, such as rubber, fruit trees, food crops, medicinal plants, and building materials. While these agroforests contain less carbon and biodiversity than primary forests, more than 50% of birds and plant life have been shown to survive in agroforests. However, agroforestry systems are increasingly being replaced by industrial plantations. In some of the most desirable lands, rubber cultivation has been replaced by more lucrative oil palm plantations. But with the development of new strains of rubber that can grow in climates unsuitable for oil palm, rubber plantings in mainland Asia proliferated. Between 2005 and 2010 more than 250,000 hectares of natural vegetation with tree cover was converted to rubber in mainland Asia. Together three countries—the United States, China, and India—consume about 60% of the world’s natural latex rubber. Thus American consumers are intricately linked to deforestation due to rubber. After hitting a peak price in 2011, a recent downturn has led to a slowing of rubber expansion. But if the market turns around, rubber could once again be a threat to forests in Southeast Asia. The majority of the world’s sugar comes from sugarcane. Sugarcane has a long and storied history of being linked with deforestation in South America and in the Caribbean. Brazil is currently the largest producer of sugarcane in the world, producing about twice as much as its closest competitor, India. Because most cars in Brazil can run on either gasoline or biofuels, a large portion of the country’s sugarcane goes into the production of ethanol. In the 2014/2015 crop year, a slightly larger portion of the sugarcane harvest was used to make biofuel than food sugar. Since at least the mid-1990s, sugarcane expansion, primarily in Brazil, has occurred without direct links to deforestation. Instead, sugarcane has expanded mostly into pasture and other crop areas. However, sugarcane may still have an important indirect role in deforestation by contributing to the overall increase in crop area and the possible expansion of pasture in the Amazon and the Cerrado. Metals, minerals, and other resources such as gold, oil, coal, iron ore, and bauxite are extracted from the ground in many tropical regions all over the world. These resources are used to power and build homes, for medical applications, in electronics, for jewelry and myriad other uses contributing to modern life. In South America, only around 0.2% of the deforestation that occurred between 1990 and 2005 (around 115,000 hectares) was directly linked to mining. However, while mining is not a leading cause of deforestation over large regions, it can have dramatic impacts in specific places. In Madre de Dios, a Peruvian Amazon region, gold mining has been estimated to have caused more than 6,000 hectares of forest loss per year since 2008. In this region, gold mining is a larger contributor to deforestation than ranching, agriculture, and logging combined. In Guyana between 2000 and 2009, 60% of deforestation was linked to mining. In the Congo Basin, mining is a huge part of many countries’ economies. Nearly a quarter of GDP of the Democratic Republic of the Congo is derived from mining. Mining is done both by large, commercial-scale operations and by small-scale artisanal miners, who lack expensive equipment and generally operate as individuals or small groups. Often artisanal miners are among the poorest and most marginalized people in society, and they use chemicals that have major health impacts. Best-practice mining would include a rehabilitation plan for the land after use, but these small operators have neither the training nor the resources for rehabilitation. Mining is also linked to road building, hunting, new settlements, unsustainable use of forest resources, fire, and forest fragmentation. Many forests are still at risk from mining: in particular, Latin America and the Congo Basin are likely to undergo growth, putting local people, ecosystems, and species at risk. A high rate of development is predicted for coming decades, with more than 25 million kilometers of new roads expected by mid-century. Roads are highly correlated with deforestation; a recent study of the Brazilian Amazon found that 95% of deforestation was within either 5 km of a road or 1 km of a waterway. In addition, hundreds of large dams are planned for environmentally sensitive ecosystems. Not only do dams turn large areas—which may include forests—into reservoirs, but their construction may bring new populations to forest areas, with no income after the dam project is completed. The inaccessibility of forests is often what allows protected areas to remain relatively intact. As new enterprises fragment a landscape, subsequent development becomes easier, leading to habitat conversion and fragmentation, poaching, illegal activities and fires. This makes infrastructure as notable for the way it functions in a landscape as for the actual area of land deforested. Shifting cultivation, or swidden agriculture, is the practice of intermittently clearing small areas of forest for subsistence agriculture, and allowing a period of fallow or regrowth of the natural forest. Shifting cultivation has long been a dominant agricultural practice in the tropical agricultural frontiers, and has been historically cited as a source of forest deforestation and degradation. However, farmers have recently been transitioning to more permanent and intensive agriculture practices, in part due to government policies and market demand. This transition can have negative implications for forests. Shifting cultivation with long fallow periods can be carbon neutral, particularly when compared to more permanent and intensive monocropped tree plantations—but intensification to maximize short-term agricultural production has been associated with lower long-term agricultural and forest productivity. In regions where shifting agriculture is still practiced, trends toward shorter fallow periods have been identified, possibly signifying more forest degradation and less environmental benefit. Many different processes, commodities, and types of development interact with one another in ways that have led to a global crisis of tropical deforestation. The contribution of these smaller drivers pales in comparison to that of beef, soy, palm oil and wood products. But the lesser drivers are important to understand because of their regional or historical linkages to deforestation—and in some cases, their example may offer hope for the future. If the deforestation impact of these commodities has waned, so too may that of the leading drivers of deforestation today.